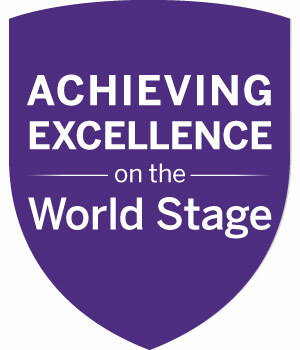 Western's success in achieving excellence on the world stage will be determined by the expertise, creativity, and passion of all members of our campus community. 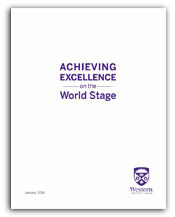 To foster the kind of culture that encourages and supports individuals and groups to realize both personal and institutional ambitions, Western recognizes the importance and value of all contributions to its Mission, to providing opportunities for personal, job and career development, and to promoting a safe, respectful, and healthy work environment in which to thrive. Western is also committed to setting ambitious high-level targets against which progress toward our goals can be monitored and corrected when necessary. The following list represents the key targets and corresponding metrics we will monitor during the lifetime of this Plan. Every attempt will be made to benchmark our progress with respect to our peer groups, and where reliable data is not available, proxies may be used. Attract the brightest students as demonstrated through the highest entering grade average and the highest number of students with external awards among Canada's leading research-intensive universities. Achieve the highest student retention and graduation rates among Canada's leading research-intensive universities. Enhance the learning experience by providing a community-based experiential learning opportunity, an international learning opportunity, or a research learning opportunity for all undergraduates who wish to pursue one as part of their degree. Increase international undergraduate student enrolment to at least 15% and domestic out-of-province student enrolment to at least 10% of the undergraduate student body. Increase graduate student enrolment to at least 20% of the total student body. Increase diversity among faculty and staff, including the recruitment and retention of designated employee groups (including women, visible minorities, aboriginal persons, and persons with disabilities) to lead or exceed the U-15 averages for representation. Add 100 research chairs, including 50 endowed chairs, in areas of strength. Increase our national share of funding awarded from each of the Federal Tri-Councils. Increase the number of faculty members who have won national and international teaching/research awards and similar distinctions. Double the number of academic Departments, Schools and Faculties that rank among the world's top 100 universities in major international surveys. Increase the share of the operating budget from non-Provincial sources by 1% per year. Surpass our $750-million “Be Extraordinary” fundraising campaign goal and grow the University's endowment to at least $500 million by 2018. Build institutional capacity to sustain fundraising beyond the current campaign, with an eventual goal of increasing annual fundraising achievements to $100 million. Double alumni engagement, as measured through a range of activities that will include alumni card requests, participation in programs and events, address updates, giving to the institution, and voluntarism, etc.